When you think of Holland, food is probably not the first thing that comes to mind. You may think wooden shoes, legal drugs, or windmills. But a great gastronomic experience is not usually on the list. You will be delighted to know that there is excellent traditional food you can have as well as modern “fusion” Dutch dishes. If you are in Amsterdam, you will find that practically any kind of food is available, from Pizza to Greek moussaka, to Dutch pancakes, pea soup and Hotch Potch. There is no rule that says you have to eat only Dutch food while you are visiting, but since some dishes are integral to the Dutch way of live, history and food, you really should try these dishes to really experience the country. Dutch Pancakes: Get ready for huge pancakes that are unlike anything you have ever had. 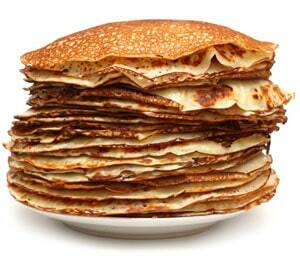 “Pannenkoeken”, as they are called, are huge compared to an American pancake. They are a bit thicker than a French crepe, but are made in a similar way. The primary ingredients are eggs, milk and flour. In the USA pancakes are usually always sweet. The Dutch do eat their pancakes with syrup, but they also have pork, bacon, and cheese in them as well. Pannenkoeken are usually eaten for dinner not breakfast but you are in Holland you can decide to have your pancakes hearty or more like a desert. Either way, you have to try at least one! Pea Soup: Called “Snert” this dish is as cliché and traditional as you can get in Holland. The Dutch are famed for the thick, stand-a-spoon-in-it, pea soup made with peas, of course, and “rookworst” or smoked sausage. If you are lucky enough to have the homemade variety, you will find that the soup is made the day before and allowed to “gel” overnight so that it is thick and tasty. This is a very hearty dish, something that will stick to your ribs. It may not be best to eat this on a hot day, as it is a traditionally winter dish. But at the very least, order some and have a few bites. You can’t say you have been to Holland otherwise. Hotch Potch: We use the related term “Hodge Podge” to mean a collection of this and that with a negative connotation. However, this idea sells Hotch Potch a bit short. 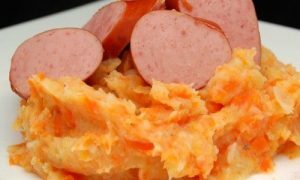 It is a stew whose main ingredients are carrots, onions and potatoes all mashed together. You may find that it is served with rye bread or cheese croquettes. It is absolutely delicious! You can find Hotch Potch with meat and if you have travelled a lot in Europe, you will see that it is similar to dishes in the British Isles and France. It is available at restaurants with modern flair and you can usually get vegetarian as well as meat based varieties. It is so traditional that even it if is not listed on a menu, just ask the chef to put a dish together for you. Between the tradition and the impromptu creativity of the chef, you will be flabbergasted at how good these simple ingredients can be together. Dutch cuisine may not be a household name, but there is no doubt that the Dutch have cuisine! Because of freezing cold winters, many dishes are hearty, to say the least. Just remember that no one expects you to eat every bit off your plate; but you should have a taste of all of these three dishes and their variations while you are in Holland.